The festival of Diwali holds special significance in India; it’s the festival of lights and sweets and crackers and lots & lots of fun; And shopping. The period which starts from Dussera and ends with Diwali is one of the most auspicious occasions in the whole calendar year. People plan out their shopping extravaganzas and splurge it out during this period. Companies such as Maruti have observed that the sale during this short period of two weeks is more than the combined sale within last 6 months. Diwali is the time to unleash the shopping animal which lies dormant for the rest of the year. There are no rules applicable during this period. But the question which haunted us since last few months was that, whether we Indians are going to spend online this Diwali? And the verdict is finally out, if a survey is to be believed – Indians are going to spend heavily on online purchases, this Diwali. In an interesting survey conducted by CashKaro.com, it was revealed that more and more Indians are now willing to shop online this Diwali and the reason is not only great discounts and cheaper prices, but convenience. Those who want to avoid long traffic jams and heavy rush at shopping malls and market places want to shop comfortably, online. The survey was conducted among 3 Lakh+ Facebook fans of CashKaro.com. Among them, 69% were men and 31% were women participants. 61% of survey participants were below 25 years of age; 36% were between 25 – 40 years and only 2% were between 40-60 years. 1.1 Who is going to shop online? 1.2 What are they going to shop online? 1.3 How much will they shop online? 1.4 Why will they shop online? Who is going to shop online? What are they going to shop online? Clothes and Accessories would be the most shopped items with 30% of respondents selecting this category for Online Shopping during Diwali. Mobiles and Gadgets come at #2 with 25% vote. Diyas, Candles and Decoration materials come at #3 and Chocolates and Dry Fruits at #4. Interestingly, 6% of all respondents chose Fire Crackers and Gold Coins as well. Indian eCommerce has evolved, all right! How much will they shop online? 92% of all respondents admitted that they will spend under Rs 25,000 shopping online. 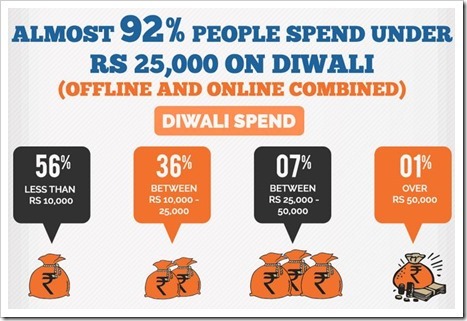 Out of them, 36% will spend somewhere between Rs 10,000 to Rs 25,000 and 56% will spend less than Rs 10,000 on online shopping this Diwali. This is a clear cut sign that Online Shopping will be huge this season. Why will they shop online? The number one reason to shop online this Diwali is convenience. People want to save time by avoiding long, never ending traffic jams and packed shopping malls. The next biggest reason is the availability of more varieties on online shopping portals, compared to their local shops. Heavy discounts and cheap prices is another reason they are going to shop online this Diwali. 42% of survey participants told that they will spend between 25 to 50% of their total shopping online, whereas 30% told that online shopping should constitute less than 25% of their overall shopping budget. Interestingly, 9% told that online shopping would be 76 to 100% of their overall shopping budget. Yes, why not, says the participants! 96% of all respondents said that they would like to receive coupons and cash back on their online shopping. That’s Diwali with a bonus. The survey results can be viewed here. What are your shopping plans for Diwali? Do your shopping needs and habits match those who took this survey? Please share your views by commenting here! Recommended Read: Online Diwali Shopping: What You Need To Keep In Mind!